TUCSON, Nov. 15 /Christian Newswire/ -- NASA's Deep Impact spacecraft captured rare photos of odd shaped Comet Hartley 2 on November 4, 2010. 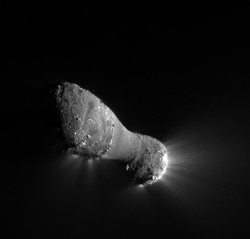 The photos showed the peanut-shaped comet shooting out jets of gas from the vents in its rocky crust. Scientists were puzzled by the volume and purity of deadly cyanide in the gas. Scientists at NASA's Jet Propulsion Laboratory in Pasadena, California expressed excitement about what they hope to learn from this unusually active comet. Archeologist and geologist Dr. Jeffrey Goodman in Tucson expressed excitement for another reason – he said that the data about Comet Hartley's multiple vents and its powerful emission of cyanide gas supports the Biblical text. In Goodman's new book "THE COMETS OF GOD-New Scientific Evidence for God: Recent archeological, geological and astronomical discoveries that shine new light on the Bible and its prophecies" he reports that most of the scientific data learned about comets in the last 25 years has already been recorded in the Bible! Long before the photos of Comet Hartley, the Bible correctly refers to the vents ("mouths") in an active comet's crust, and then correctly tells how these vents can powerfully spew out poisonous gas that can kill men (Revelation 9:17-19). Revelation 8:10-11 tells of a comet impact that is to poison rivers. Goodman says the Bible even gives an account of a cometary "blast" that probably contained cyanide (Isaiah 37:7) which killed 185,000 invading Assyrians outside the gates of Jerusalem during the reign of King Hezekiah (Isaiah 37:36-37). THE COMETS OF GOD shows that most of the major catastrophes described and prophesied in the Bible can be explained as a consequence of cometary phenomena. From Noah's Flood, the destruction of Sodom and Gomorrah, the Exodus out of Egypt to Revelation's mysterious events, Goodman makes a compelling case for comet activity being the smoking gun. Goodman also reveals important scientific information about comets hidden in the Bible and documents recently discovered impact sites and their connection to ancient catastrophes recorded in the Bible. Time magazine has noted that believers have become more interested than ever before in scientific evidence that helps to establish the reality of the events underlying their faith. Hardback copies and e-books of THE COMETS OF GOD are available on Amazon and Barnes and Noble. Added information and books are also available at www.thecometsofgod.com. To arrange an interview with Dr. Goodman please see the contact information given above. Dr. Goodman's previous books on archeology have had major media coverage. This is his first book as a Christian.